Hop in and buckle your seat belts - We're off on a free trip to Barranmor, a tiny isle off the Scottish coast. Our host is Catherine Kinnery, author of Tippie & the Big Cat. A gentle, but steadily-developed plot, and use of playful Scottish dialect made me feel as though I was right there and as welcome as a plate of warm shortbread on a September afternoon. Although this is marketed as a children's book, anyone who likes a breezy, peaceful read will enjoy this island escape. Although this is a new release, it reflects a return to yesterday's values of community and of connecting to one's natural environment. Gail: Why did you write Tippie & the Big Cat? Catherine: I wanted to write a story set in a very natural place by the sea. I didn't initially intend to write a children's story but I realised, as the characters developed in my mind, that 'Tippie & The Big Cat' was essentially a story for children. Gail: How did you come up with the story? Catherine: As I said, location is important to me, even though I don't think my writing's particularly descriptive. The Island of Barranmor is really a fusion of amazing island and coastal places I've visited around the UK. Those places are very much at the forefront of my mind in dreaming up scenarios for the 'Tippie' stories. Gail: What else have you written? Is this your first published book? Catherine:Yes, this is my first published book. I've written quite a lot in the past as I studied creative writing for a couple of years. From the point of view of a writer, what makes the 'Tippie' stories special is the extent to which it's really simple story-telling and also writing in the first person (Tippie herself is the narrator of the stories). Gail: What message does Tippie & the Big Cat have for children? There's a message there for grown-ups, too, I see. Can you tell us about that, as well? Catherine: I think for children, the message is that of Grandma Hendry (she pinches it from Stephen Hawking!) when she tells Tippie to "be curious." Also, it's about valuing where you are and who you're with because Tippie isn't a hugely privileged child but she really enjoys her life with her friends on Barranmor. I suppose the inherent message for adults is that we should be encouraging and supportive of children and help them to connect with the world around them. Gail : Without spoiling the ending, does the book also make a statement about education in the 21st century? Catherine: I guess 'Tippie & The Big Cat' implies that the obsession with curriculum, assessment and attainment in education can mean that children become alienated from what's naturally important to them. I'm afraid Miss Tarleton is a rather bleak and negative representation of a teacher and actually I think she's more of a throwback than anything else. To be honest, I just found her a funny character to write and I thought adults reading the story would find her funny, although children reading it may well -along with Tippie and her classmates- find her fairly incomprehensible at times! Gail : Oh, I don't know about that - My son has certainly met a Miss Tarleton or two in his day! Of course, we know most teachers do their best with what they have, which can be an uphill fight against all the things you just mentioned. Let's talk about your writing: describe your favorite place to do your writing. Tell me what you write on (paper tablet, back of old grocery lists, smartphone, iPad, computer?). Catherine: Obviously I prefer to write in a comfortable, quiet place but I find that when I'm in the right frame of mind to write I can adapt quite easily to less-than-ideal surroundings as the drive to get my ideas down is so strong. I often type directly into the computer and love the scope that gives to edit what I've written easily; but I also write on paper if I'm away from home and then type up my scribbles later. I have appalling handwriting, though, so I can't leave it too long before I type up hand-written notes, or else I can't decipher what I've written! Gail: Absolutely! I know my iPad covers a multitude of sins; now, with Dragon software, I can even conceal my dismal typing skills. What words of encouragement do you have for new writers? Catherine: Embrace the age of electronic self-publishing! I was writing for a number of years and putting lots of effort into sending work off to agents without getting anywhere. Just as I was becoming despondent, I discovered Smashwords, the electronic publishers. It's amazing that you can publish for free and connect with readers all over the world via companies like Smashwords and Amazon. Gail: Is Tippie & the Big Cat available in print? Catherine: No, it's not at the moment. This is something I will pursue if I think it's worthwhile but at the moment I think the opportunities to connect with readers through e-books are so great, that I'm just pursuing that route. Gail: Will we be hearing more from your pen? Is a sequel to Tippie planned? Catherine: I hope to write a series of 'Tippie' stories because I'm really enjoying writing and developing those characters. The next story, 'Tippie & The Lost Chords', is already in the pipeline. In it, Mara Sturgess' uncle's ceilidh band visit Barranmor and, true to their name, get lost - Tippie and George have to find them! Gail: Well, I'll certainly be looking forward to that. When I was looking for books to review, I chose 10, and cast aside half of them right off the bat, because they weren't paragraphed or punctuated right. Another went, because the characters were too fresh (or, as the British say, "cheeky"). That left your book, and Janice Alonso's latest, and a couple of others. Thank you so much for a good read about a nice place, inhabited by nice people! 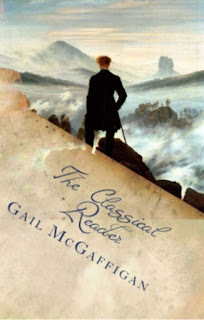 Catherine: Thanks again for including my book in your blog, Gail.